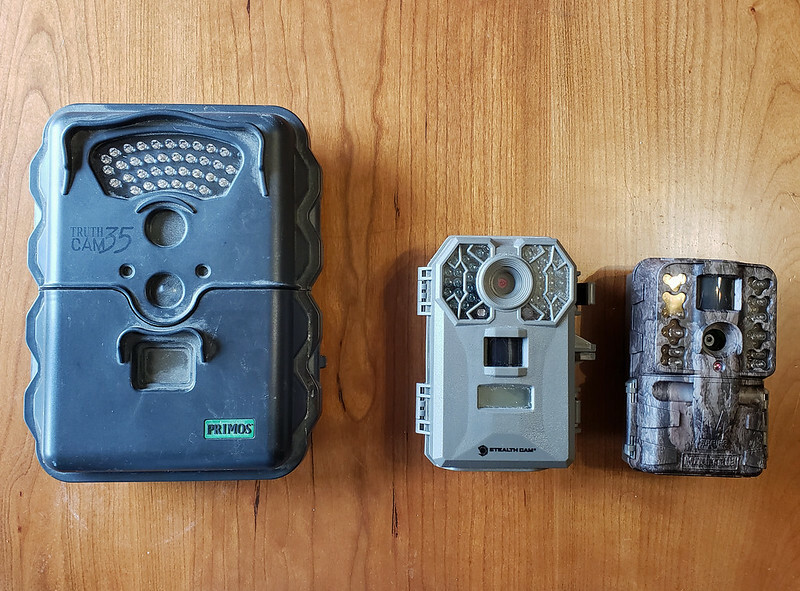 My first Trail Cam is a Primos Truth Cam 35. It's has 4 megapixels, triggers at maximum 30 feet, and the flash is only good for night pictures up to 10 feet. It still works great, but is outdated. My second Trail Cam is a Stealthcam ST-G30. It has 8 megapixels, triggers at 40 feet, and the flash goes about 70 feet for night shots. .
My newest cam is a Moultrie M-50i. It has 20 Megapixels pictures, and 1080p HD video, infrared technology detection triggers up to 80 feet, and can take night pictures up to 100 feet. It has invisible flash so animals and people won't see it. They keep getting smaller and better. I could see how it would be very easy to lose that camera on the far right in the woods if you got confused about where you left it. My neighbor has a camera like on the far left and he uses it to capture photos of bobcats, coyotes, javelina and big owls that are attracted to his bird feeders in his back yard. I always record it's location on a handheld GPS and also take a picture of where it's at before I leave so I can find it. I always camouflage it so people won't notice it. That is why the smaller the better. Nice...I still have one of my big old D battery one as well. I still use it. The infrared no flash cameras are great my favorite 2 are brownings black ops that don’t glow red and I got a stealth cam out there too. Deer and animals notice the red glow on the cheaper stealth cam. Yes. I noticed that as soon as most animals notice the red glow they take off. You can see them looking right at the camera before they leave.